Well, now we’ve actually had the chance to take the Gametel games controller for a spin so we can really tell you what it’s all about. The controller itself is a mix of textured and smooth plastics with a few white graphics on the D-pad and four primary buttons. The whole thing is small enough to comfortably fit in your pocket when fully packed down and it’s light so you won’t notice it when you’re not using it. The spring loaded clamp on the top allows you to drop in your droid of choice and you’re then ready to fire it up. The start button doubles as the on/off switch and once it’s powered up, the rest of the set up is droid-side, no rocket science here. Fructel have already created a driver app on the Android Market, which not only allows you to choose your Gametel controller as the preferred input method for your device, an option you will have to switch to and from when you switch to something like your on-screen keyboard, but also shows a list of compatible titles (currently a shortlist of 50 and growing). 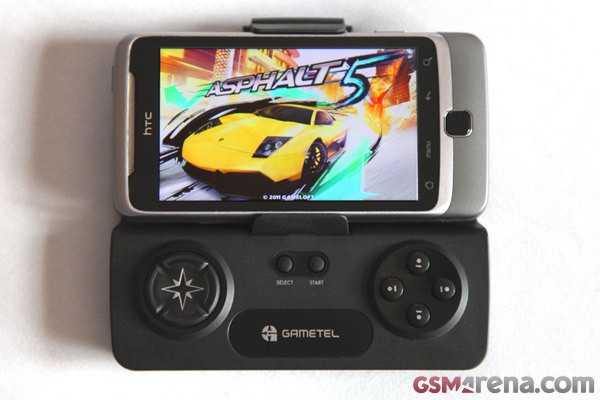 Asphalt 5 HD was our initial guinea pig and the Gametel certainly wowed with its responsiveness. There were no issues with latency or connectivity and it undoubtedly made for a more enjoyable experience than using on-screen controls. Trial Xtreme was the second title (demoed above) and again, the experience was smooth and seamless. Being a Bluetooth peripheral, the Gametel doesn’t have to be attached to the device and in truth, the bracket won’t allow for much past perhaps a 4″ display anyway, but as such, range is safely useable up to around 10 meters, which is decent to say the least. Depending on the game in play, you can even use four separate Gametels for local multiplayer gaming, which is a welcome feature and actually quite a powerful tool in the Gametel’s repertoire. It won’t quite equal the likes of the Xperia PLAY in terms of usability, but it does make mobile gaming a viable option for a host more Android devices out there, that otherwise, probably wouldn’t be seeing much action past Angry Birds. Size and weight are minimal, battery life is an impressive 9 hours and it does its job well. For those of you wanting to enhance your mobile gaming experience, without locking yourself into the Xperia PLAY or forking out the extra cash for a Nintendo 3DS or PS Vita, the Gametel offers a low cost alternative (it retails for £50 on Amazon UK) that might just be right for you, and if you get bored for the day, it’s not stuck on your device for good. Check out this link for the Gametel’s official site including detailed specs and a link to their Amazon store page. Let us know your thoughts on the prospect of gaming with the Gametel or if you already own one, your experiences so far, in the comments below.